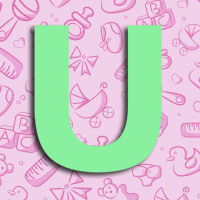 For the letter ‘U’ I have chosen to share some Useful Apps. Nowadays we are so lucky to have so many useful apps that help us track our babies development or play them calming sounds. Here are a few of my favourites. This is a great app that tracks your baby’s expected developmental milestones and shows you a ‘weather report’ for the current week. It explains how changes such as learning to percieve ‘smooth transitions’ can be scary and bewildering for them and that they may need extra support and cuddles during these fussy stages. So far, whenever my little one has had a difficult week where she has been super clingy or having difficulty sleeping, it has corresponded with one of the ‘wonder weeks’ on the app. You can find out more about the app and download it here. This was a lifesaver for me during the first few weeks, when my health visitor wanted to know how many wet and dirty nappies my baby had had within 24 hours, how often she had eaten and so on. I was so sleep deprived that I could hardly remember when I had last changed her nappy, let alone how many she had gone through. Baby Daybook lets you easily record feedings, changes, sleep, medicine dosages, weight and other useful information. Instead of typing, you simply press play when an activity starts and press stop when it finishes, the app does the rest. The statistics can be really useful if you want to track your baby’s development over time. I don’t use it so often now we’ve got into a routine, but I occasionally track a day or two so that I can compare it to how she was a month or so ago. You can get Baby Daybook here. In the womb, the sound of blood whoosing around is as loud as a vacuum cleaner for your baby, so it makes sense that similar whoosing sounds will help to soothe a crying baby. This app has lots of different white noise tracks for helping your baby get to sleep and stay asleep. My little one loves the heavy rainfall and human heartbeat sounds. There are lots of different white noise apps, but this one is available here from Amazon. Have you ever used an app to help you with parenting? If so, please share!